Events Feb. 2-3 include the Hello-Goodbye Viaduct Arts Festival, viaduct walks/tours and a Tunnel to Viaduct 8K fun run. Walk on Seattle’s iconic Alaskan Way Viaduct before it’s history and run or stroll in the new tunnel Saturday, Feb. 2, at the city of Seattle’s Hello-Goodbye Viaduct Arts Festival and Washington State Department of Transportation’s Step Forward events. With last month’s closure of the viaduct and the upcoming tunnel opening (expected soon), Saturday’s events are for pedestrians only — via Seneca Street and the Battery Street Tunnel for the Arts Festival, and North Hub and South Hub entry points for Step Forward events. Online tickets for viaduct walks and tours are sold out, but there will be walk-up lines for access to the viaduct at the Seneca Street ramp and through the Battery Street Tunnel. The best arrival time for people without advance tickets is estimated to be between 1:30 and 5:30 p.m. Organizers hope to accommodate everyone but can’t guarantee access if the wait extends past the event’s 6:30 p.m. end time. Saturday’s events start with a Tunnel to Viaduct 8K fun run for participants who want to be one of the first to step foot in the new tunnel and last to run on the viaduct. The course starts near Seattle Center and also includes Pioneer Square and Sodo neighborhoods. Friday is the last day to register online; there’s no day-of-race registration. Public events Saturday feature the official ribbon-cutting ceremony at the south end of the Highway 99 tunnel at 11:30 a.m. and timed access to the tunnel/viaduct tours starting at 12:30 p.m. There will be STEM (science, technology, engineering and math) activities on tunnel boring at the North Hub, no ticket required. There also will be food trucks and access to the community celebration on the viaduct. The Hello-Goodbye Viaduct Arts Festival is a once-in-a-lifetime chance to see art installations by 100 regional artists and organizations on the viaduct, along with performances and activities for all ages. Everyone is invited to the festival’s opening Musical and Performance Procession beginning on Seneca Street at 12:30 p.m. Saturday. There’s also a last bike ride on the viaduct Sunday morning, but it’s been sold out for more than a week. As many as 100,000 people are expected to be on hand to say farewell to the viaduct, so arrival by public transportation is suggested. Trip-planning information is available through the King County Metro Transit Planning Tool or the Sound Transit Trip Planner. Bicycle parking is available at the Pyramid Alehouse parking lot. While you’re in the neighborhood, the Seattle Historic Waterfront Association is offering a variety of specials to encourage visits to the waterfront during the viaduct closure. 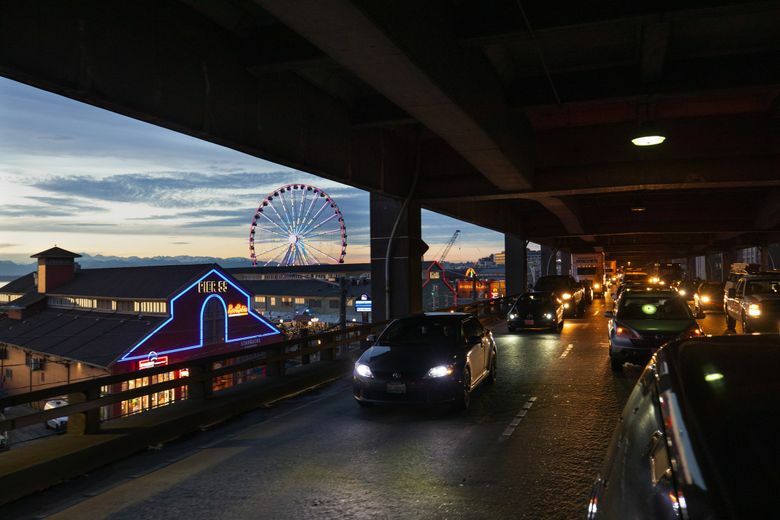 Continuing through Sunday, deals include buy-one-ride-get-one-free on the Seattle Great Wheel and a free cup of chowder at Ivar’s Acres of Clams and Pier 54 Fish Bar. Businesses from Pier 54 to Pier 66 also are offering deals. Some require coupons available on the event website.